Look, there’s nothing inherently wrong with the tried-and-true flavor combination of blueberries (or strawberries or pineapple) and bananas for your standard morning smoothie. Your basic fruit smoothie remains popular because: 1) It tastes good, 2) It’s easy, and 3) It makes you feel like you’re starting your day off right. But there’s one little problem: It’s basic. And you’re not a basic kind of person, are you? You’re extra. And if you want to kick your mornings off in an extra sort of way, you need to kick your smoothie game up a notch. 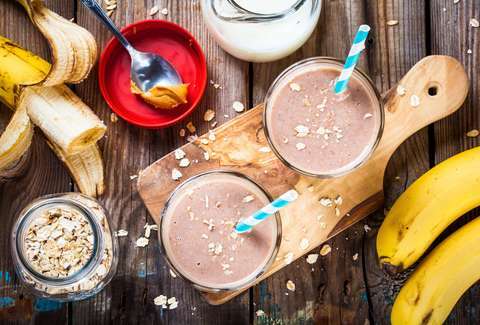 These fruit-and-veggie smoothie combinations may seem a little unusual, but they’ll help give you the energy and nutrients you need to help you power through your morning. Yeah, yeah, yeah, you’re already on the fence about putting spinach in your smoothie, but hemp seeds, too? There’s a reason for the medley. “Spinach and hemp seeds provide plant-based protein and iron, which is great for vegetarians and vegans. However, humans don’t absorb iron well from plant sources, but vitamin C helps. One cup of OJ provides the daily recommended needs of vitamin C, as well as ⅓ of the recommended daily calcium if the OJ is enriched,” says Registered Dietitian Colleen Wysocki-Woods, the owner of Zest Nutrition. To be fair, the green spinach blended with the orange juice won’t leave your smoothie looking very Instagram-worthy, but don’t let that stop you from trying the recipe. Just close your eyes and down the citrusy-flavored drink, knowing you’re starting the morning off right. If you’re hitting the gym hard and it’s hard to meet your daily calorie needs, especially in the mornings, the combination of nut butter and Greek yogurt will help you get there. “This combination provides enough calories to act as a complete meal, along with all of the macronutrients -- proteins, carbs, and fats,” Wysocki-Woods says. “Research recommends getting 30-grams of protein at breakfast, and this shake comes in just under that mark at 28-grams. 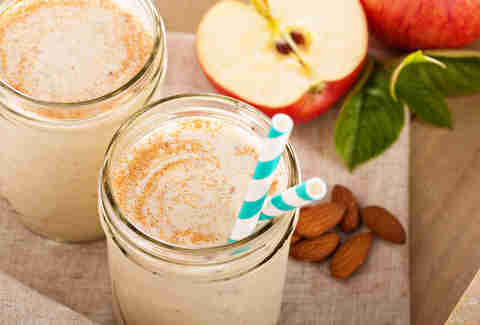 High-protein breakfasts jumpstart your metabolism while helping to manage blood sugar spikes." You’ve been lectured on the importance of eating fruit since you were a little kid, but traditional fruit smoothies aren’t necessarily as beneficial as you might think. “Many smoothies are loaded with carbs that come mostly from fruit. This gives you short-term energy, but it’ll leave you feeling hungry and tired before long,” says Christy Brissette, Registered Dietitian and President of 80 Twenty Nutrition. By making smoothies with whole fruits (skin and all), vegetables, and nuts, Brissette says you’ll get the added fats, proteins, and fiber needed to keep you full and to keep your blood sugar steady. One of Brissette’s favorite recipes offers an apple for sweetness, but combines it with celery for its fiber and digestive benefits and almonds. “By including a ¼ cup serving of almonds, you’ll get the filling and energizing combo of protein, fiber, and healthy fats for slow, sustained energy. Almonds are an excellent source of vitamin E, containing more than other nuts per ounce. If you want to stay close to the berry-centric flavor profile you’ve grown accustomed to in a smoothie, all you have to do is add avocado and spinach to your favorite combination. “Leafy greens such as spinach and kale are packed with fat-soluble vitamin A and vitamin K. To fully absorb any fat-soluble vitamin, they need to be paired with a heart-healthy fat source,” says Jamie Miller, Registered Dietitian at the Camelback Village Racquet & Health Club. By adding avocado to the mix, you’re getting those healthy fats along with a smooth, creamy texture. Laura Williams is an exercise physiologist and fitness writer whose biggest health goal is to enjoy a balanced lifestyle. Check out her book, Partner Workouts, on Amazon, and connect on Twitter @LWilliams_EXSS.